Product management should not be done in a silo. 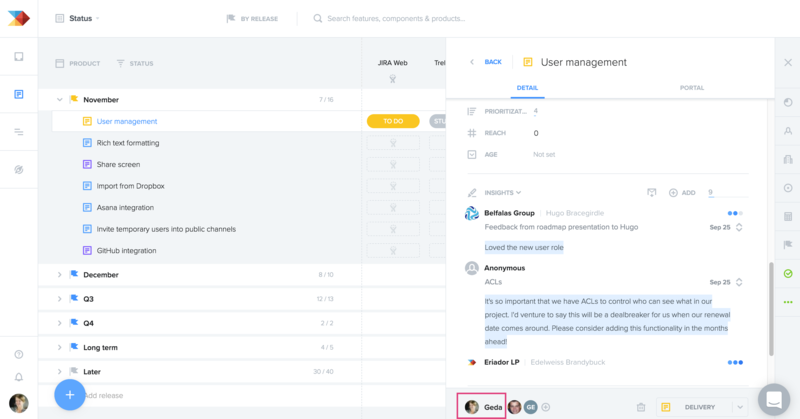 Collaborate with customer-facing colleagues on sales, support, and marketing to get user inputs into productboard. Invite designers into productboard to analyze user needs and follow up with users to perform more in-depth research. Get complexity estimates from engineers and help them understand the context behind every feature that gets prioritized. 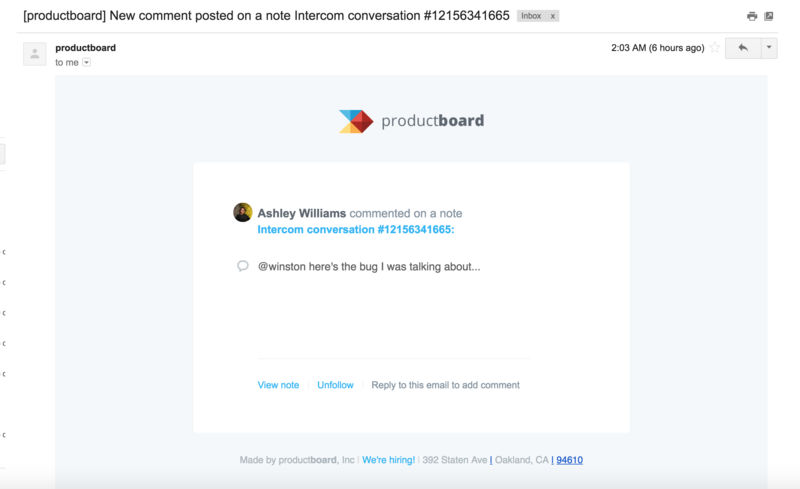 Notifications help by alerting all relevant parties that a conversation of interest to them is taking place somewhere in productboard. Note: Data columns include all columns that can be added to the Features board, e.g. a specific Task or Competitor. The owner of a feature is typically the product manager who is responsible for it. There can only be one owner of a note/feature. By default, the owner of a note is the person who submitted it, even if they do so via integration, the productboard extension for Chrome, or by forwarding an email. By default, the owner of a feature is the person who created it, but ownership can be resassigned to another product manager who will be responsible for the feature moving forwards. Followers are all project members who are interested in receiving updates whenever there's a new comment on a note/feature/data column. Unlike owners, there can be multiple followers on a feature. In addition to in-app notifications, you'll receive email notifications for all of the events listed above. If you're interested in receiving more comprehensive email summaries of what's changed in your project each day, you can enable the Daily overview email in the Account Info settings page. These emails include information on which notes/features were created, and which have been updated with regard to name, description, status, owner, and position in the product hierarchy. At this time, owners/followers only receive notifications for the events listed above.